I believe this is origami's third pick. Factory Grey is a grey creme. Lol, yeah, that's about all there is to it. Well, there is a slight pink thing going on with it. That might just be my skin reflecting off it though. I originally didn't like it much but it grew on me. Sorry for my index and ring fingers. On my index finger there was barely any top coat on the brush so it ended up scraping it. And on my ring finger, I was moving my chair up and accidentally wiped some of it off on the chair. Two coats with top coat. My Poshe is so dead and dying. Anyway, this is very close to a one coater. I am just continually impressed by American Apparel's formula. Pic of the Moment: Here's a pic that StBFF took of all the manicures I did last Saturday. One of the ladies whose nails I did left early. And bottom right corner with the french mani and konading is StBFF's hands. How awesome you did all of these nails! Beautiful photo! 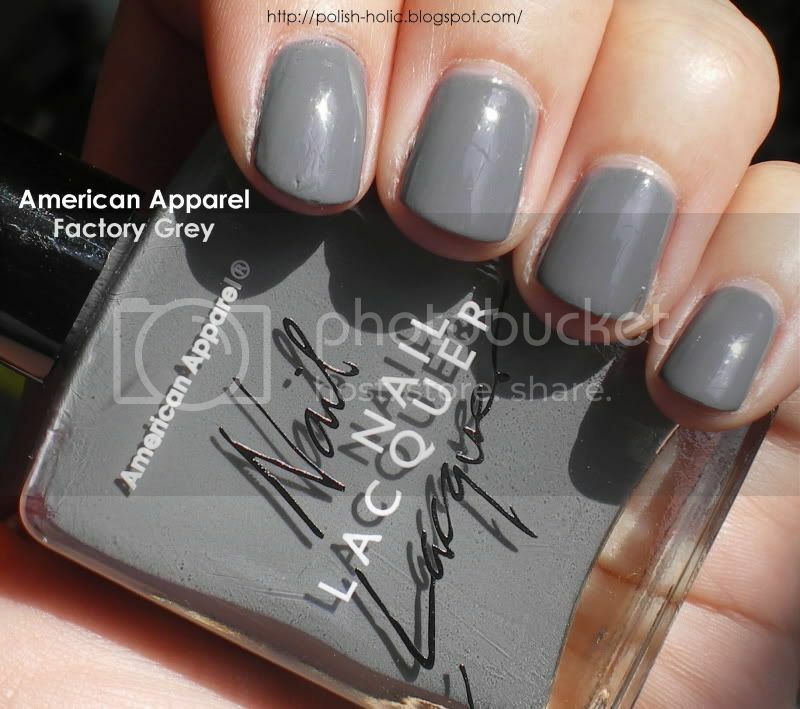 i love this grey !! I'm impressed at your manicuring skillz. I cannot do someone else's nails to save my liiiiife. I got your package today. If you were on Gchat right now I would have raved at you about it. I love the polishes. I love them. Thank you. I love grey... but beside Essie "Chinchilly" I haven't truly gone into it. There are too many colors to wear and not enough days, not enough hands and not enough feet. wow! what a great job, and such a cute pic too! susies1955: I'll check it out, thanks for the heads up! Lily nail: It's a pretty good grey. Stephanie: I took this class called personal images in high school that taught you how to do manis. So it wasn't too bad. jellynat: If you flew over, I'd totally do your nails. And that polish is OPI Big Apple Red. OH MY POLISH! : Thanks, and will check it out now. Thanks! And for the heads up too.